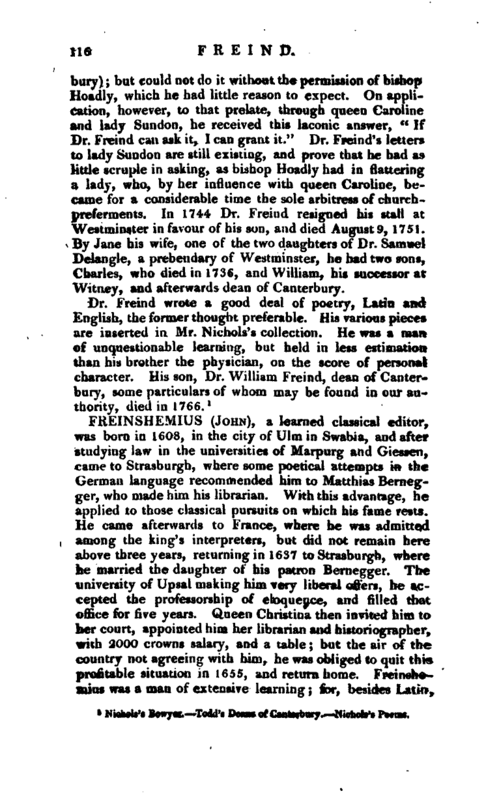 , a learned classical editor, was born in 1608, in the city of Dim in Swabia, and after studying law in the universities of Marpurg and Giessen, came to Strasburgh, where some poetical attempts in the German language recommended him to Matthias Bernegger, who made him his librarian. With this advantage, he applied to those classical pursuits on which his fame rests. He came afterwards to France, where he was admitted among the king’s interpreters, but did not remain here above three years, returning in 1637 to Strasburgh, where he married the daughter of his patron Bernegger. The university of Upsal making him very liberal offers, he accepted the professorship of eloquence, and filled that office for five years. Queen Christina then invited him to her court, appointed him her librarian and historiographer, with 2000 crowns salary, and a table; but the air of the country not agreeing with him, he was obliged to quit this profitable situation in 1655, and return home. 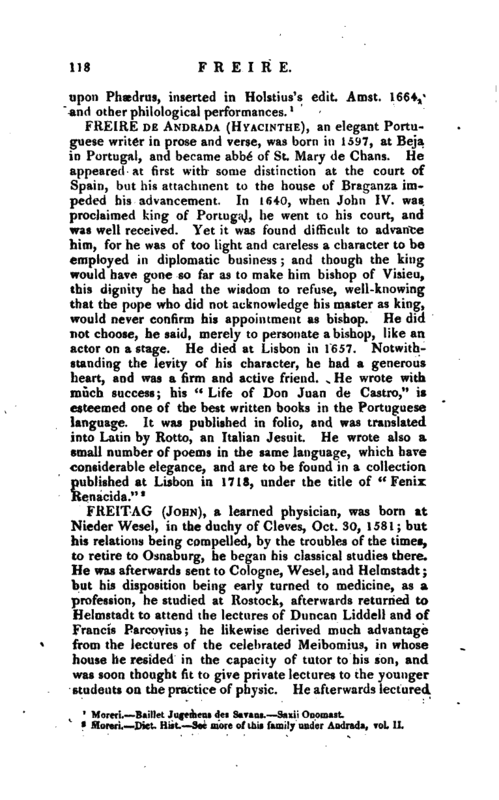 Freinshewas a man of extensive learning; for, besides Latin, | Greek, and Hebrew, he was familiar with almost all the living languages of Europe, and his fame induced the elector Palatine, when he projected the restoration of the university of Heidelberg, to appoint him honorary professor, and electoral counsellor. He accordingly removed with his family to Heidelberg in 1656, and died there in 1660. 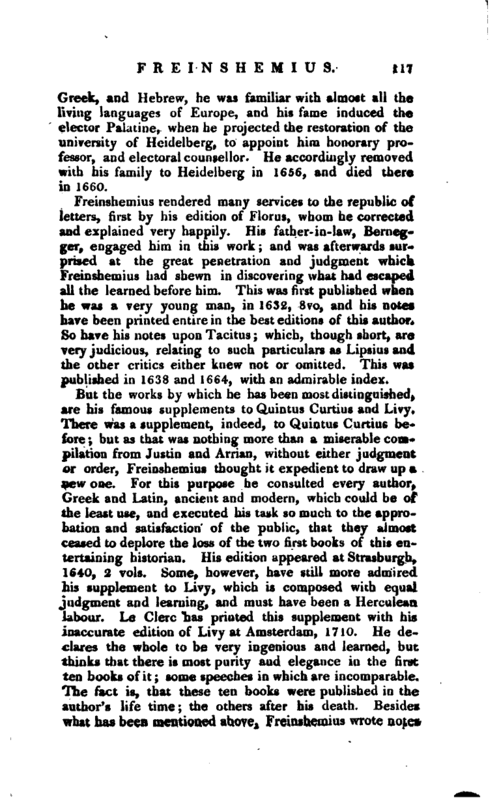 Freinshemius rendered many services to the republic of letters, first by his edition of Florus, whom he corrected and explained very happily. His father in-law, Bernegger, engaged him in this work; and was afterwards surprised at the great penetration and judgment which Freinshemius had shewn in discovering what had escaped all the learned before him. This was first published when he was a very young man, in 1632, 8vo, and his notes have been printed entire in the best editions of this author. So have his notes upon Tacitus; which, though short, are very judicious, relating to such particulars as Lipsius and the other critics either knew not or omitted. This was published in 1638 and 1664, with an admirable index. Moreri. Baillet Jugemens des Savans. Saxii Onemast.